"November Criminals" redirects here. For the American crime film, see November Criminals (film). The stab-in-the-back myth (German: Dolchstoßlegende, pronounced [ˈdɔlçʃtoːsleˌɡɛndə] ( listen), literally "dagger stab myth")[a] was the notion, widely believed and promulgated in right-wing circles in Germany after 1918, that the German Army did not lose World War I on the battlefield but was instead betrayed by the civilians on the home front, especially the republicans who overthrew the Hohenzollern monarchy in the German Revolution of 1918–19. Advocates denounced the German government leaders who signed the Armistice on November 11, 1918, as the "November Criminals" (German: November­verbrecher). When the Nazi Party came to power in 1933, they made the legend an integral part of their official history of the 1920s, portraying the Weimar Republic as the work of the "November criminals" who stabbed the nation in the back to seize power while betraying it. The Nazi propaganda depicted Weimar as "a morass of corruption, degeneracy, national humiliation, ruthless persecution of the honest 'national opposition'—fourteen years of rule by Jews, Marxists, and 'cultural Bolsheviks', who had at last been swept away by the National Socialist movement under Adolf Hitler and the victory of the 'national revolution' of 1933". Scholars inside and outside Germany unanimously reject the notion, pointing out the German army was out of reserves, was being overwhelmed by the entrance of the United States into the war, and by late 1918 had lost the war militarily. To many Germans, the expression "stab in the back" was evocative of Richard Wagner's 1876 opera Götterdämmerung, in which Hagen murders his enemy Siegfried – the hero of the opera – with a spear in his back. The antisemitic instincts of the German Army were revealed well before the stab-in-the-back myth became the military's excuse for losing the war. In October 1916, in the middle of World War I, the army ordered a "Jewish census" of the troops, with the intent to show that Jews were under-represented in the Reichswehr (army), and that they were over-represented in non-fighting positions. Instead, the census showed just the opposite, that Jews were over-represented both in the army as a whole and in fighting positions at the front. The Reichswehr then suppressed the results of the census. I have asked His Excellency to now bring those circles to power which we have to thank for coming so far. We will therefore now bring those gentlemen into the ministries. They can now make the peace which has to be made. They can eat the broth which they have prepared for us! As the military situation for the Germans on the Western Front became ever more precarious, Prince Maximilian of Baden reached out to the American President Woodrow Wilson, indicating that Germany was willing to accept his Fourteen Points. On November 11, 1918, the representatives of the newly formed Weimar Republic signed an armistice with the Allies which would end World War I. As the Kaiser had been forced to abdicate and the military relinquished executive power, it was the temporary "civilian government" that sued for peace—the signature on the armistice document was of Matthias Erzberger, a civilian, who was later murdered for his alleged treason. The subsequent Treaty of Versailles led to further territorial and financial losses. The official birth of the term "stab-in-the-back" itself possibly can be dated to the autumn of 1919, when Ludendorff was dining with the head of the British Military Mission in Berlin, British general Sir Neill Malcolm. Malcolm asked Ludendorff why it was that he thought Germany lost the war. Ludendorff replied with his list of excuses, including that the home front failed the army. Malcolm asked him: "Do you mean, General, that you were stabbed in the back?" Ludendorff's eyes lit up and he leapt upon the phrase like a dog on a bone. "Stabbed in the back?" he repeated. "Yes, that's it, exactly, we were stabbed in the back". And thus was born a legend which has never entirely perished. The phrase was to Ludendorff's liking, and he let it be known among the general staff that this was the "official" version, which led to it being disseminated throughout German society. It was picked up by right-wing political factions, and was even used by Kaiser Wilhelm II in the memoirs he wrote in the 1920s. Right-wing groups used it as a form of attack against the early Weimar Republic government, led by the Social Democratic Party (SPD), which had come to power with the abdication of the Kaiser. However, even the SPD furthered the myth when the party leader, Friedrich Ebert, told troops returning to Berlin that "No enemy has overcome you." Reviews in the German press that grossly misrepresented General Frederick Barton Maurice's book, The Last Four Months, also contributed to the creation of this myth. William Shirer writes that "Ludendorff made use of the reviews to convince Hindenburg" about the validity of the myth. In 1919, Deutschvölkischer Schutz und Trutzbund leader Alfred Roth, writing under the pseudonym Otto Arnim, published the book The Jew in the Army which he said was based on evidence gathered during his participation on the Judenzählung, a military census which had in fact shown that German Jews had served in the front lines proportionately to their numbers. Roth's work claimed that most Jews involved in the war were only taking part as profiteers and spies, while he also blamed Jewish officers for fostering a defeatist mentality which impacted negatively on their soldiers. As such, the book offered one of the earliest published versions of the stab-in-the-back legend. In November 1919, the newly elected Weimar National Assembly initiated a Untersuchungsausschuß für Schuldfragen to investigate the causes of the World War and Germany's defeat. 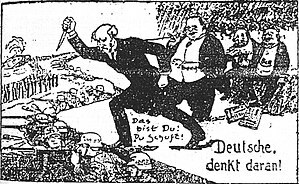 On November 18, von Hindenburg testified in front of this parliamentary commission, and cited a December 17, 1918 Neue Zürcher Zeitung article that summarized two earlier articles in the Daily Mail by British General Frederick Barton Maurice with the phrase that the German army had been "dagger-stabbed from behind by the civilian populace" (von der Zivilbevölkerung von hinten erdolcht). Maurice later disavowed having used the term himself. It was particularly this testimony of Hindenburg that led to the widespread Dolchstoßlegende in post-World War I Germany. Barth also shows that the term was primarily popularized by the patriotic German newspaper Deutsche Tageszeitung that repeatedly quoted the Neue Zürcher article after Hindenburg had referred to it in front of the parliamentary inquiry commission. Charges of a Jewish conspiratorial element in Germany's defeat drew heavily upon figures like Kurt Eisner, a Berlin-born German Jew who lived in Munich. He had written about the illegal nature of the war from 1916 onward, and he also had a large hand in the Munich revolution until he was assassinated in February 1919. The Weimar Republic under Friedrich Ebert violently suppressed workers' uprisings with the help of Gustav Noske and Reichswehr General Groener, and tolerated the paramilitary Freikorps forming all across Germany. In spite of such tolerance, the Republic's legitimacy was constantly attacked with claims such as the stab-in-the-back. Many of its representatives such as Matthias Erzberger and Walther Rathenau were assassinated, and the leaders were branded as "criminals" and Jews by the right-wing press dominated by Alfred Hugenberg. The noted German historian Friedrich Meinecke attempted to trace the roots of the expression in a June 11, 1922 article in the Viennese newspaper Neue Freie Presse. In the 1924 national election, the Munich cultural journal Süddeutsche Monatshefte published a series of articles blaming the SPD and trade unions for Germany's defeat in World War I, which came out during the trial of Adolf Hitler and Ludendorff for high treason following the Beer Hall Putsch in 1923. The editor of an SPD newspaper sued the journal for defamation, giving rise to what is known as the Munich Dolchstoßprozess from October 19 to November 20, 1925. Many prominent figures testified in that trial, including members of the parliamentary committee investigating the reasons for the defeat, so some of its results were made public long before the publication of the committee report in 1928. The Dolchstoß was a central image in propaganda produced by the many right-wing and traditionally conservative political parties that sprang up in the early days of the Weimar Republic, including Hitler's NSDAP. For Hitler himself, this explanatory model for World War I was of crucial personal importance. He had learned of Germany's defeat while being treated for temporary blindness following a gas attack on the front. In Mein Kampf, he described a vision at this time which drove him to enter politics. Throughout his career, he railed against the "November criminals" of 1918, who had stabbed the German Army in the back. Even provisional President Friedrich Ebert contributed to the myth when he saluted returning veterans with the oration that "no enemy has vanquished you" (kein Feind hat euch überwunden!) and "they returned undefeated from the battlefield" (sie sind vom Schlachtfeld unbesiegt zurückgekehrt) on November 10, 1918. The latter quote was shortened to im Felde unbesiegt ("undefeated on the battlefield") as a semi-official slogan of the Reichswehr. Ebert had meant these sayings as a tribute to the German soldier, but it only contributed to the prevailing feeling. The theme of stab-in-the-back was articulated in 1919 most prominently by General Erich Ludendorff, one of the two top German commanders. He blamed the Berlin government and the civilian population for the armistice/surrender of November 1918, saying they had failed to support him, had let him down, and had proved themselves unworthy of the traditions of a fighting nation. He popularized the Dolchstoß terminology, and became a prominent right-wing leader in the 1920s. Conservatives, nationalists and ex-military leaders began to speak critically about the peace and Weimar politicians, socialists, communists, Jews, and sometimes even Catholics were viewed with suspicion due to presumed extra-national loyalties. It was claimed that they had not supported the war and had played a role in selling out Germany to its enemies. These November Criminals, or those who seemed to benefit from the newly formed Weimar Republic, were seen to have "stabbed them in the back" on the home front, by either criticizing German nationalism, instigating unrest and strikes in the critical military industries or profiteering. In essence, the accusation was that the accused committed treason against the "benevolent and righteous" common cause. These theories were given credence by the fact that when Germany surrendered in November 1918, its armies were still occupying French and Belgian territory, Berlin remained 450 miles from the nearest front, and the German armies retired from the field of battle in good order. The Allies had been amply resupplied by the United States, which also had fresh armies ready for combat, but the UK and France were too war-weary to contemplate an invasion of Germany with its unknown consequences. On the Western Front, although the Hindenburg Line had been penetrated and German forces were in retreat, the Allied army had not reached the western German frontier, and on the Eastern Front, Germany had already won the war against Russia, concluded with the Treaty of Brest-Litovsk. In the West, Germany had had successes with the Spring Offensive. Contributing to the Dolchstoßlegende, its failure was blamed on strikes in the arms industry at a critical moment of the offensive, leaving soldiers without an adequate supply of materiel. The strikes were seen to be instigated by treasonous elements, with the Jews taking most of the blame. The weakness of Germany's strategic position was exacerbated by the rapid collapse of the other Central Powers in late 1918, following Allied victories on the Macedonian and Italian fronts. Bulgaria was the first to sign an armistice on September 29, 1918, at Salonica. On October 30 the Ottoman Empire capitulated at Mudros. On November 3 Austria-Hungary sent a flag of truce to ask for an armistice. The terms, arranged by telegraph with the Allied Authorities in Paris, were communicated to the Austrian commander and accepted. The Armistice with Austria-Hungary was signed in the Villa Giusti, near Padua, on November 3. Austria and Hungary signed separate treaties following the collapse of the Austro-Hungarian empire. Nevertheless, the idea of domestic betrayal resonated among its audience, and its claims would provide some basis for public support for the emerging National Socialist Party, under an autocratic and chauvinistic form of nationalism. Anti-Jewish sentiment was intensified by the Bavarian Soviet Republic, a Communist government which ruled the city of Munich for two weeks before being crushed by the Freikorps militia. Many of the Bavarian Soviet Republic's leaders were Jewish, allowing anti-Jewish propagandists to connect Jews with Communism (and thus treason). Richard M. Hunt argues in his 1958 article that the myth was an irrational belief which commanded the force of irrefutable emotional convictions for millions of Germans. He suggests that behind these myths was a sense of communal shame, not for causing the war, but for losing it. Hunt argues that it was not the guilt of wickedness, but the shame of weakness that seized Germany's national psychology, and "served as a solvent of the Weimar democracy and also as an ideological cement of Hitler's dictatorship". It was necessary for the Nazi régime and/or the German Generals to surrender unconditionally in order to bring home to the German people that they had lost the War by themselves; so that their defeat should not be attributed to a "stab in the back". Parallel interpretations of national trauma after military defeat appear in other countries. For example, it was used regarding the United States' involvement in the Vietnam War, without the anti-Semitic slant. The song The Battle-Hymn of Lieutenant Calley claims that "While we're fighting in the jungles they were marching in the street. / While we're dying in the rice fields they were helping our defeat. / While we're facing V.C. bullets they were sounding a retreat". See also Vietnam Syndrome. ^ Despite the similarity of the German word Legende and the English word "legend", "stab-in-the-back myth" is the preferred term in English. ^ This is described similarly by William Helmreich and Francis Nicosia. Helmreich noted that: "Der staatsfeindliche Zionismus, published in 1922, was Rosenberg's major contribution to the National Socialist position on Zionism. It represented in part an elaboration on ideas already expressed in articles in the Volkischer Beobachter and in other published works, notably Die Spur. The title provides the gist of a thesis that Rosenberg sought to convey to his readers: 'The Zionist organization in Germany is nothing more than an organization that pursues a legalized undermining of the German state.' He accused German Zionists of having betrayed Germany during the war by supporting Britain's Balfour Declaration and pro-Zionist policies and charged that they had actively worked for a German defeat and the Versailles settlement to obtain a Jewish National Home in Palestine. He went on to assert that the interests of Zionism were first and foremost those of world Jewry, and by implication the international Jewish conspiracy." Nicosia: "Rosenberg argues that the Jews had planned the Great War in order to secure a state in Palestine. In other words, he suggested that they generated violence and war among the gentiles in order to secure their own, exclusively Jewish, interests. In fact, the title of one of those works, Der Staatsfeindliche Zionismus ("Zionism, the Enemy of the State"), published in 1922, conveys the gist of Rosenberg's approach to the question, an approach that Hitler had been taking in some of his speeches since 1920. Rosenberg writes: 'The Zionist Organization in Germany is nothing more than an Organization that perpetrates the legal subversion of the German state.' He further accuses the Zionists of betraying Germany during World War I by supporting Great Britain and its Balfour Declaration, working for a German defeat and the implementation of the Balfour Declaration, supporting the Versailles settlement, and embracing the Jewish National Home in postwar, British-controlled Palestine." ^ Kolb, Eberhard (2005). The Weimar Republic. New York: Routledge. p. 140. ISBN 0415344425. ^ Watson, Alexander (2008). Enduring the Great War: Combat, Morale and Collapse in the German and British Armies, 1914–1918. Cambridge: Cambridge Military Histories. ch. 6. ISBN 9780521881012. ^ Roberts, J. M. (1999). Twentieth Century: The History of the World, 1901 to the Present. London: Allen Lane/The Penguin Press. p. 289. ISBN 0-713-99257-3. ^ Wheeler-Bennett, John W. (Spring 1938). "Ludendorff: The Soldier and the Politician". Virginia Quarterly Review. 14 (2): 187–202. ^ Levy, Richard S. (2005). Antisemitism: A Historical Encyclopedia of Prejudice and Persecution. Santa Barbara: ABC-CLIO. pp. 623–624. ISBN 1851094393. ^ a b Steigmann-Gall, Richard (2003). The Holy Reich: Nazi Conceptions of Christianity, 1919–1945. New York: Cambridge University Press. p. 16. ISBN 0521823714. ^ Barth, Boris (2003). Dolchstoßlegenden und politische Desintegration: Das Trauma der deutschen Niederlage im Ersten Weltkrieg 1914–1933 (in German). Düsseldorf: Droste. pp. 167 and 340f. ISBN 3770016157. Barth says Doehring was an army chaplain, not a court chaplain. The following references to Barth are on pages 148 (Müller-Meiningen), and 324 (NZZ article, with a discussion of the Ludendorff-Malcolm conversation). ^ a b Brendon, Piers. The Dark Valley: A Panorama of the 1930s. p. 8. ISBN 0-375-40881-9. ^ Helmreich 1985, p. 24. ^ Nicosia 2008, p. 67. ^ Fraser, Lindley (1945). Germany Between Two Wars: A Study of Propaganda and War-Guilt. New York: Oxford University Press. p. 16. ^ a b "1918 Timeline". ^ Hunt, Richard M. (1958). Myths, Guilt, and Shame in Pre-Nazi Germany. Virginia Quarterly Review. 34. pp. 355–371. In the last analysis, the deep emotion that gave rise to these myths in pre-Nazi Germany was essentially an overwhelming sense of communal shame. It was not at all a shame related to the responsibility for causing the war. Much more, it was a shame related to the responsibility for losing the war. ^ Wheeler-Bennett, John W. (1954). The Nemesis of Power: The German Army in Politics, 1918–1945. London: Macmillan. p. 559. Nicosia, Francis R. (5 May 2008). Zionism and Anti-Semitism in Nazi Germany. Cambridge University Press. ISBN 978-0-521-88392-4. Chickering, Rodger (2004). Imperial Germany and the Great War, 1914–1918. Cambridge: Cambridge University Press. ISBN 0521547806. Diest, Wilhelm; Feuchtwanger, E. J. (1996). "The Military Collapse of the German Empire: the Reality Behind the Stab-in-the-Back Myth". War in History. 3 (2): 186–207. doi:10.1177/096834459600300203. Schivelbusch, Wolfgang (2001). The Culture of Defeat: On National Trauma, Mourning, and Recovery. New York: Picador. ISBN 0312423195. Watson, Alexander (2008). "Stabbed at the Front: After 1918 the Myth Was Created That the German Army Only Lost the War Because It Had Been 'Stabbed in the Back' by Defeatists and Revolutionaries on the Home Front. Reviews the Clear Evidence That in Reality It Simply Lost the Will to Go on Fighting". History Today. 58 (11). Wikimedia Commons has media related to Stab-in-the-back legend. Die Judischen Gefallenen A Roll of Honor Commemorating the 12,000 German Jews Who Died for their Fatherland in World War I.